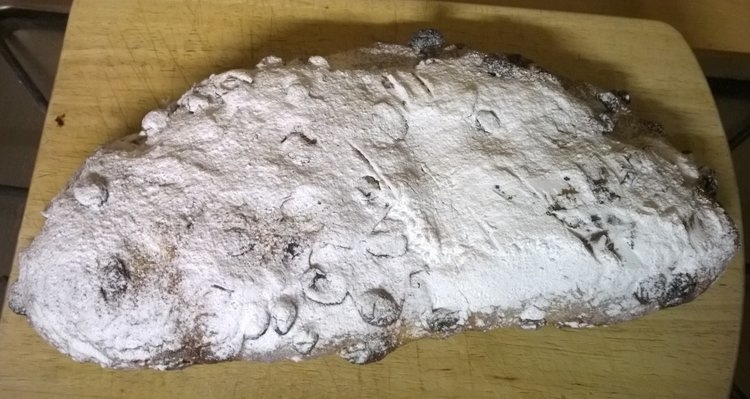 I love Stollen at Christmas, but had previously only ever tried shop-bought. This year I decided to make my own. I scoured the internet for recipes and settled on this one from Weekend Bakery. I followed it pretty much exactly, with a just a couple of small tweaks, and I’m very pleased with how it came out. It’s less sweet than the shop-bought ones I’ve tried previously and I prefer it this way, it is after all meant to be a bread rather than a cake. The citrus sugar, almond paste, and soaked fruit are best prepared somewhere between one week and one day before, as they will benefit from maturing a little, however you can at a pinch just make and use them at the time if you didn’t plan ahead! – Brandy (Or rum, or whiskey, or orange juice, or just water). (You only need 150g of the almond paste for the recipe, but as with the citrus sugar, it will keep for a while in the fridge and has other uses, or you could just make less of course). 1. For the citrus sugar – mix the lemon and orange zest well into the sugar and store in a tub in the fridge. 2. 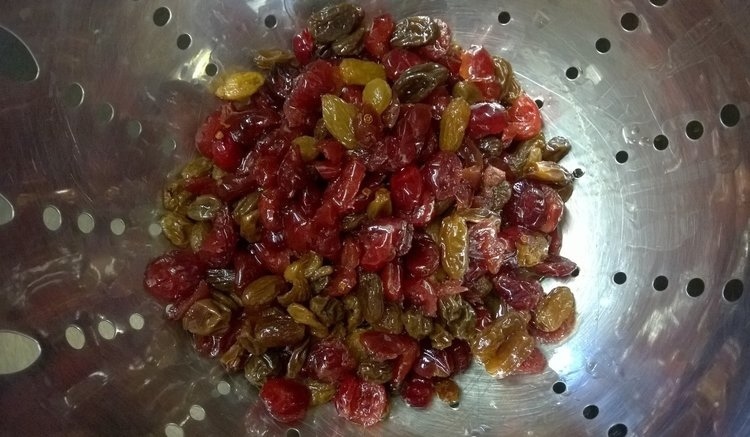 For the soaked fruit – place the dried fruit into a tub or jar and pour the brandy, or whatever liquid you’re using, until it comes to the top of the fruit. Place the lid on and store in the fridge. If you are using orange juice or water, then just do it the night before. If you are doing it on the day itself, then you will need to use hot water, either on its own, or mixed half and half with the brandy or orange juice, and then soak for at least 15 minutes (cold liquid won’t soak in quick enough). 3. For the almond paste – mix the ground almonds with the icing sugar and lemon zest, and then add water a little at a time until you end up with a firm kneadable paste. Store in an airtight tub in the fridge until ready to use. Do not add the egg yolk yet if you are making the paste before the day of use. 4. Tip the fruit into a sieve and leave it to drain well (if you’ve used brandy or other liquor, then don’t drain it into the sink, catch it, it makes a lovely drink as it is, or could be used in other recipes). 5. Combine half of the flour with the yeast, the egg yolk, and the lukewarm milk. Mix well, cover and leave to stand for 30 minutes. 6. Combine into the mixture the rest of the flour, the salt, the softened butter, and 15g of the prepared citrus sugar. Turn onto a lightly floured surface and knead for 10 to 12 minutes until it is smooth and supple, and slightly sticky. 7. 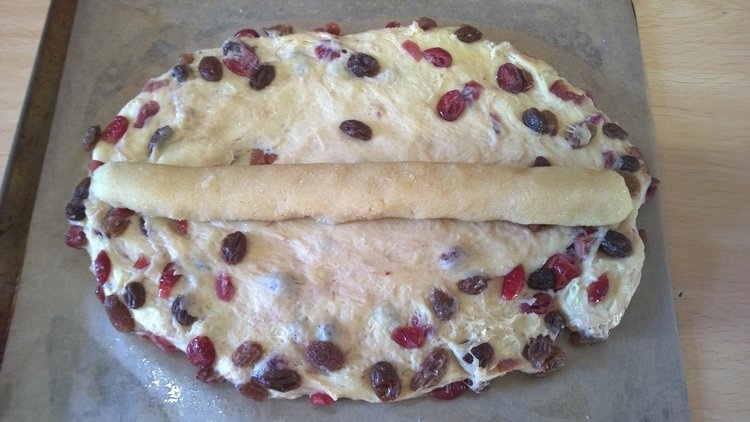 Mix a tablespoon of flour into the drained fruit, and work this into the dough. You will end up with quite a wet sticky dough, but if it is unworkably sticky, then knead in a little more flour. 8. Shape the dough into a ball, and place into a lightly oiled bowl. Cover and place somewhere warm for 20 minutes. 9. Shape the dough into a loaf shape, place it onto the baking tray it will be cooked on (I lined mine with baking paper first), and cover with lightly oiled cling wrap. Place somewhere warm for another 20 minutes. 10. Using your hands or a rolling pin, flatten it out, with the centre channel being thinner than the edges. 11. Take 150g of the almond paste, knead an egg yolk into it, roll it into a sausage shape and place it along the thinner channel in the dough, make sure it is a little shorter than the dough. 12. Fold half of the dough over the bump of the almond paste, and press down firmly. 13. Cover it again with the oiled cling wrap, and put back in the warm place to rise for up to an hour. To check if it is risen enough, press gently on the dough, if the dent stays there, it is ready, if it springs back it isn’t. 14. Place it in a preheated oven 180C/350F for about 35 minutes until it is golden brown and hollow sounding to tap. Keep an eye on it during cooking, if it browns too quickly, cover it with some foil for the rest of the cooking time. 14. Cool it on a rack for 10 minutes, then brush generously with melted butter. When it is completely cool, sift some icing sugar over the top. Serve cut into big slices, either on its own or spread with butter. I bet it tastes as good as it looks. Very pretty pastry! I often prefer these type of sweet dough bakes to cakes actually, this recipe’s a keeper! Vanessa I actually have never heard of this before. It looks like a fair bit of work but I would gladly sample some of yours! 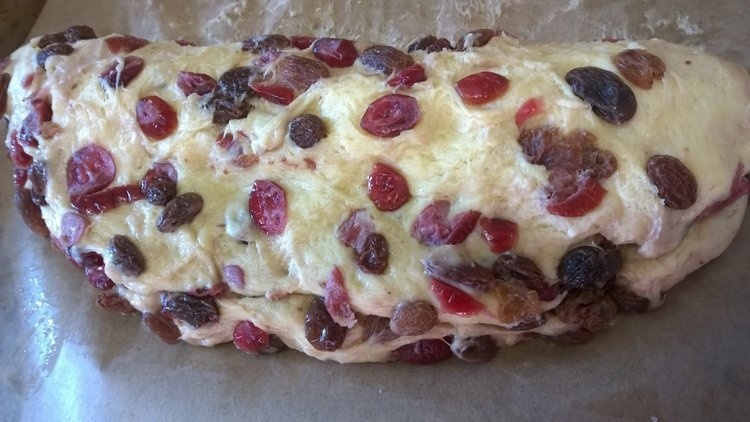 It’s a traditional German Christmas bread, maybe it hasn’t really taken off in Canada – it’s only in the last few years that it’s become very popular in England. It’s actually less work than it sounds, even though there are lots of things to do, each thing is pretty quick and easy, so it didn’t feel like I’d done any kind of marathon baking session! Yes, but it is Christmas! And some very brave outside photography to catch the early morning frost as a background! Bravo! 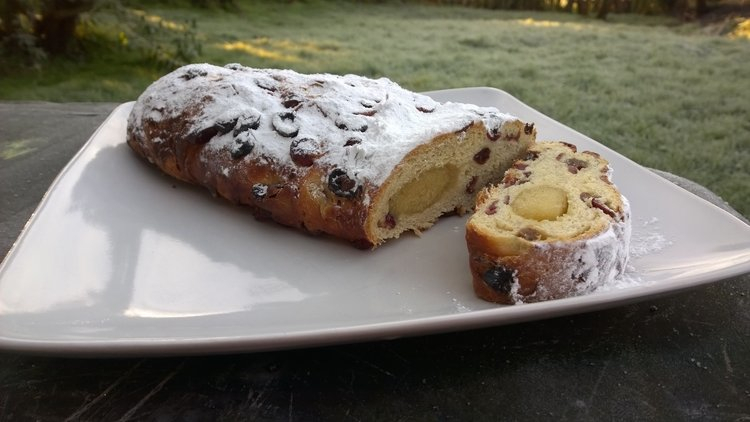 I have never had stollen, but I think I would like it!